Project obstacles and solutions: The new Joseph Warren Middle and High Schools project achieves many firsts for Kentucky educational facilities. 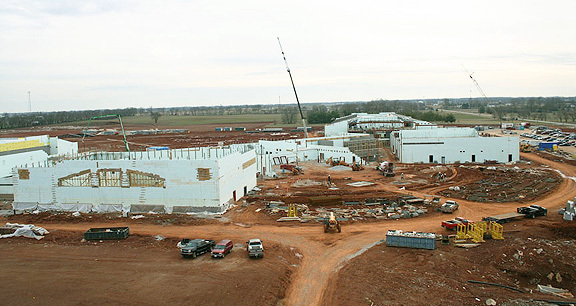 When completed, the building will be the largest public school facility in the state, with approximately 330,000 square feet of space sitting on a 100 acre site. The two schools are uniquely designed to connect with a common foyer. The building is engineered to be highly energy efficient. It will be the first educational project to utilize ICF (insulated concrete forms) construction for the entire structural wall system of the building, including interior and exterior load bearing walls. It will be the largest single-structure ICF installation in North America. ICF construction is well-known for speeding up the construction of concrete walls and for its high insulation value. ICFs can achieve R-values of up to R-26. It also greatly reduces air infiltration rates. To complement the efficiency of the ICF structure, the facility will have a super-insulated roof system and dual stage compressors in the geothermal heat pumps for added efficiency. Beyond the insulation value of ICF construction, it is gaining momentum for its zero-waste capabilities. Walter Mansfield of Beacon Construction said there was very little waste in the 18,000 yards of concrete they poured. "We have had almost zero waste due to the ability of starting and stopping the wall pours at any given point." The Warren County Schools have earned numerous awards for energy efficient and sustainable site construction for their school buildings. They plan to build the first "net-zero" energy-use school in the nation, which is scheduled to meet LEED Platinum certification. IMI has partnered with Warren County Schools to provide green materials, including imix Eco Pave pervious concrete for water runoff quality and quantity and the concrete for ICF construction using recycled post-industrial pozzolans that reduce the amount of cement in the concrete mix.